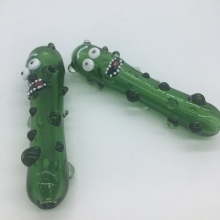 This smoking pipe is made of fine quality glass, cute, funny, smooth. With the cucumber design that gives you a different feeling of experience. Exclusive and unique design, you won&apos;t be able to find this anywhere. Perfect size pipe for smoking both outdoor and indoor, you will get the exact same one in the picture. Easy to clean and store away. Ergonomic design pipe, easy to handle. With the cucumber design that gives you a different feeling of experience. Smoking pipe is made of fine quality glass, cute, funny, smooth.